Department of Physics, SCSVMV University, Tamil Nadu, INDIA. Note: If Java is not installed in your computer. Please install Java (click here) before using following software tools. If you have any queries regarding software tools, please feel free to contact at [email protected]. **Please cite the reference article/s of the respective tools, along with the web site link. ** The Java libraries utilized in developing these software tools are also mentioned below. ** If your input file is very large or if there is a possibility of generation of large output file, then prefer .csv file type over .xlsx and .xls. Since there is a memory limit for xls/xlsx file type, which may cause incomplete execution of the program (program will stop and throw java heap size error). This can be avoided (up to a limit) by using CSV file. 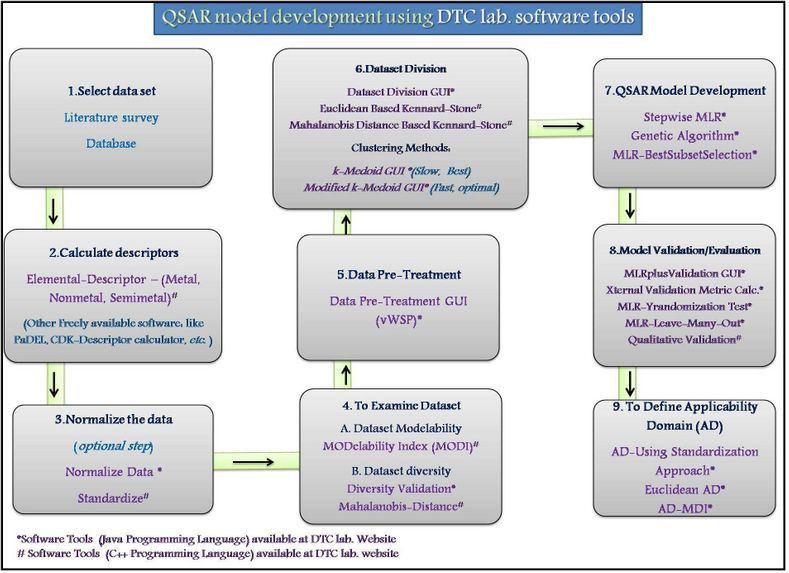 As the name suggests, Partial Least Squares version 1.0 tool can be used to develop QSAR models using partial least squares (PLS) technique and further it can also be used to perform validation of the developed PLS model via computing various internal and external validation metrics. The tool follows Non-linear Iterative Partial Least Squares (NIPALS) algorithm as described in the literature [Ref. 1]. In this tool, the optimal number of components for the PLS models can be defined by the user or can be decided by the tool based on the Q^2 (LOO) values judged after addition of next component. It is based on the fact that the program will stop if further addition of an additional component does not increase Q^2 (LOO) value for the training set by at least 5%. Note that, though, a single PLS model can be built for multiple, correlated Y (or dependent) variables, but in the present tool, only single Y variable is allowed. This shortcoming will be fixed as soon as possible with the next version of tool. 1. Wold, Svante, Michael Sjöström, and Lennart Eriksson. "PLS-regression: a basic tool of chemometrics." Chemometrics Intelligent Laboratory Systems 58.2 (2001): 109-130. Massive screenings of large chemical libraries against panels of biological targets have led to the rapid expansion of publicly available databases such as ChEMBL, PubChem, BindingDB etc. A basic assumption of any cheminformatics study is the accuracy of the input data available in various databases. However, one should be concerned about the poor quality and the irreproducibility of both the chemical and biological records present in such databases. Curating both chemical and biological data, i.e., verifying the accuracy, consistency, and reproducibility of the reported experimental data is critical for the success of any cheminformatics studies, including Quantitative Structure-Activity Relationships (QSAR). The double cross-validation process comprises two nested cross-validation loops which are referred as internal and external cross-validation loops. In the outer (external) loop of double cross-validation, all data objects are divided into two subsets referred to as training and test sets. The training set is used in the inner (internal) loop of double cross-validation for model building and model selection, while the test set is exclusively used for model assessment. So in the internal loop, the training set is repeatedly split into calibration and validation data sets. The calibration objects are used to develop different models whereas the validation objects are used to estimate the models‟ error. Finally, the model with the lowest prediction errors (validation set) in the inner loop is selected. Then, the test objects in the outer loop are employed to assess the predictive performance of the selected model. This method of multiple splits of the training set into calibration and validation sets obviates the bias introduced in variable selection in case of usage of a single training set of fixed composition [see the Reference article (click here) for further reading]. Double Cross-validation Tool (version 2.0) performs the double cross-validation process as mentioned above. Here, the user has to provide the training and test sets (descriptors and the response variable) information in the respective input files. A genetic algorithm (GA) is a search heuristic method that mimics the process of natural selection. Where the exhaustive search is impractical, heuristic methods are used to speed up the process of finding a satisfactory solution. Genetic algorithms belong to the larger class of evolutionary algorithms (EA), which generate solutions to optimization problems using techniques inspired by natural evolution, such as inheritance, crossover, mutation, and selection. Here, the Genetic Algorithm tool 4.1 performs the genetic algorithm for selection of significant variables (descriptors) during QSAR model development using Fitness Function based on recently reported MAE-based criteria. To select best descriptor combination out of set of descriptors by evaluating all possible combinations of descriptors in the input file. Along with the conventional parameters like R2, Q2, Q2f1, Q2F2; the prediction quality of training as well as test set is judged using recently reported MAE based criteria (For reference, see reference article for XternalValidationPlus Tool below). Further using the MAE-based metrics, QSAR score is computed that can be used to select the best QSAR models. User can define r^2 cut-off and inter-correlation cut-off values, which is useful to reduce the computational time and to remove models with inter-correlated descriptors, respectively. Xternal Validation Plus is a tool which computes all the required external validation parameters, while further it also judges the performance of prediction quality of a QSAR model based on the MAE-based criteria. The “AD using Standardization approach” is a tool to find out compounds (test set/query compounds) that are outside the applicability domain of the built QSAR model and it also detects outliers present in the training set compounds. Nano-Profiler (endpoint-dependent analogues identification software) is a tool to predict respective property/endpoint of nanoparticle’s using nano-QSAR models present in provided database (inside "Data" folder), which are already reported in the literature, and then to perform clustering to find analogues based on respective predicted endpoint. We have also included three more clustering methods i.e. k-Medoids algorithm (slow and exhaustive; searches best ‘k’ medoids), modified k-Medoid (fast; searches optimum ‘k’ medoids), Euclidean distance-based method, for analogues identification. Applicability domain- Model Disturbance Index (AD-MDI) program is a tool to define applicability domain (AD) of unknown samples based on a concept proposed by Yan et. al. (see reference below). For more information regarding defining AD and finding AD of query compounds please read the article (see reference below). This program is the updated version of the previous version (now removed). The only difference between two versions is that in updated version the AD of query compounds can be determined (optional), which was not included in the previous version. To Download and Run: Click on download button(it will direct you to google drive) and then press "ctrl + S (Windows) or cmd+S (Macs)" to save as zip file. Extract the .zip file and click on .jar file to run the program. Note: The program folder will consist of three folders "Data", "Lib" and "Output". For user convenience, user may keep input files in "Data" folder and may save output file in "Output" folder. "Lib" folder consist of library files required for running the program. Check the format of training, test set input files (.xlsx/.xls/.csv) and query file (.xlsx/.xls/csv) before using the program (sample input files provided in Data Folder). This tool perform stepwise MLR using two methods: 1) using alpha value, 2) using F value. User can also select data pre-treatment option to remove constant and inter-correlated descriptors prior to performing stepwise MLR. Three output files are generated 1) LogFile.txt : Consist of names of descriptor (constant and/or intercorrelated) removed based on variance and correlation-coefficient cut-off; 2) SMLR.txt : Information regarding descriptor selected/removed along with validation parameters at each step, based on f-values (F-to-Enter,F-to-Remove) or alpha-value (alpha-to-Enter,alpha-to-Remove) cut-offs; 3) xlsx/xls/csv file : consist of set of descriptors selected (along with activity/property column) after performing stepwise MLR. *Version 1.3 uploaded with a resolved bug. Modified K-Medoid is a simple and fast algorithm for K-medoids clustering (see reference below). The above algorithm is a local heuristic that runs just like K-means clustering when updating the medoids. This method tends to select k most middle objects as initial medoids. The algorithm involves calculation of the distance matrix once and uses it for finding new medoids at every iterative step. To Download and Run : Click on download button(it will direct you to google drive) and then press "ctrl + S (Windows) or cmd+S (Macs)" to save as zip file. Extract the .zip file and click on .jar file to run the program. Note: The program folder will consist of three folders "Data", "Lib" and "Output". For user convenience, user may keep input file in "Data" folder and may save output files in "Output" folder. "Lib" folder consist of library files required for running the program. Check the format of data file (.xlsx/xls/csv) before using the program (sample input file provided in Data Folder). To remove the constant and highly correlated descriptors based on user specified variance and correlation cut-off values using V-WSP algorithm (see reference below). Dataset division GUI is a user friendly application tool,which includes three different methods i.e. Kennard-Stone based, Euclidean Distance based(or Diversity based) and Activity/Property based dataset division into training and test set. To Download: Click on download button(it will direct you to google drive) and then press "Ctrl + S (Windows) or cmd+S (Macs)" to save as zip file. Extract the .zip file and click on .jar file to run the program. Note: User may keep dataset file in “data” folder and also may select “output” folder for storing output files. (sample input file provided in data folder). "Does Rational Selection of Training and Test Sets Improve the Outcome of QSAR Modeling?" published in J. Chem. Inf. Model. (Click here). The k-medoids algorithm is a clustering algorithm related to the k-means algorithm and the medoid shift algorithm. Both the k-means and k-medoids algorithms are partitional (breaking the dataset up into groups) and both attempt to minimize the distance between points labeled to be in a cluster and a point designated as the center of that cluster. In contrast to the k-means algorithm, k-medoids chooses datapoints as centers (medoids). In this case, cost is calculated using Manhattan distance. For detail information, see wikipedia: Click here. To Download: Click on download button(it will direct you to google drive) and then press "Ctrl + S (Windows) or cmd+S (Macs) " to save as zip file. Extract the .zip file and click on .jar file to run the program. ***Please check the input file format (*.csv): (First) Serial number column, Descriptors..columns, activity/property column (Last column). This tool develops QSAR models by performing MLR and calculates internal, and external validation parameters [1,2] of the developed models. It further judges the quality of test set predictions based on the prediction errors (i.e. MAE-based) as GOOD, MODERATE and BAD. It also checks Golbarikh and Tropsha model acceptibillity criteria , and determine applicability domain (AD) using two methods i.e. Standardization approach  and Euclidean-based method . One can also perform Y-randomization test. To remove the constant and highly correlated descriptors based on user specified variance and correlation cut-off values. The Train-Test version helps while doing data pretreatment to training set. The set of descriptors removed in training set are also removed from corresponding test set. To Download GUI version: Click on download button(it will direct you to google drive) and then press "Ctrl + S (Windows) or cmd+S (Macs)" to save as zip file. Extract the .zip file and click on .jar file to run the program. Sample Input files are provided in the program folder. To ensure that the compounds of the test set are representative of the training set (i.e. whether the test set structures are within the applicability domain or not). It is based on distance scores calculated by the Euclidean distance norm. To observe structural diversity in selected dataset, in terms of distance scores (calculated by the Euclidean distance norm). Note: To observe diversity among compounds present in dataset; plot a ‘scatter plot’ of Normalized Mean Distance Vs Respective Activity/Property. Recently , an interesting article is published regarding diversity assessment method in J. Chem. Inf. Model. (Click here, 2013). According to this article, the descriptors based on atom topology (i.e., fingerprint-based descriptors and pharmacophore-based descriptors) can be successfully used for diversity assessment of compounds present in dataset. This test is performed to check the robustness of the QSAR model by building several random models via shuffling the dependent variables, while keeping the independent variables as it is. The resultant random models are expected to have significantly low r^2 and q^2 values for several trials, to pass the test. Another parameter, cRp^2 is also calculated, which should be more then 0.5 for passing this test. To perform Leave-‘n’-Out cross validation (in true sense), that means this program performs MLR calculations leaving each possible combination of ‘n’ compounds, where n is the user defined value. Since Leave-n-out is computationally expensive, try to keep value of ‘n’ less (up to 4 for 100 compounds in training set). Check the output text file generated for validation parameters (Q^2 and SDEP). Note: Number of combination (displayed when you start running program) and progress bar will assist you to decide value of ‘n’. Please check sample input file (*last column must be activity column and no compound no./serial no. column). To normalize the data by scaling between 0 to 1. This tool is helpful when you want to assign new names to the molecules present in the SDF. 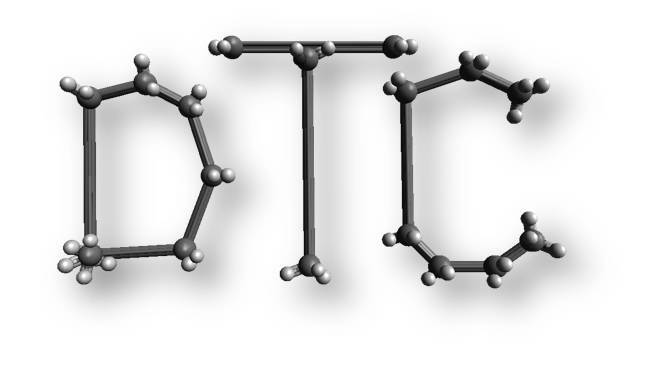 The first line of each molecule represent the molecule name (the molecule name can be missing) and also note that in SDF each molecule is separated by other molecule via ‘$$$$’ notation. You can observe this, if you open the SDF in any text editor like Notepad, Wordpad, Notepad++. Please see input file/s provided with the tool folder for further clarification. This tool helps in checking the molecule 'name' (and not the file names) if correctly saved or not, while we draw structures in structural editors like ChemDraw. Note that the file name and the molecule name is different, and one can check the molecule name by opening the MOL file via any text editor like notepad, wordpad, notepad++. The first line usually consists of molecule name (the molecule name can be missing). For instance, while drawing more than 1 structure with same common scaffold, we save each file as ‘*.mol’ with some name, let say, “molecule1.mol’, and then we just change the required functional group keeping the common scaffold same and save the next molecule with different name like “molecule2.mol”. However, in such cases, many times the file name changes but the molecule names (inside mol file) remain same, which create problem while analyzing the molecules in a software which displays molecules names and not file names as molecule identifier. Thus using this tool you can identify those molecules for which the file name and molecule name is different, so that you can correct those by manually changing the molecule names in the MOL file using any text editor mentioned before. Please see input file/s provided with the tool folder for further clarification. This tool helps in extracting any property value from the SDF (only if that property is provided in the sdf file). For example when you download a database of compounds with activity (or any property) value embedded in the sdf. Now, when the numbers of molecules in the SDF are higher, it will be cumbersome to extract activity value from the SDF file which corresponds to each molecule in the SDF for further analysis. Hence, this tool helps in extracting any such property along with the molecule name and save it in a text file (output file). Please see input file/s provided with the tool folder for further clarification. This tool extracts only those molecules from the parent SDF file whose names (not file name) are mentioned in a text file (provided by the user) and save it as SDF. Please see input file/s provided with the tool folder for further clarification. This simple tool provides the number of all possible combination using nCr (combination formula) methodology. This tool can be helpful while deciding ‘r’ in leave-r-out (cross validation method; available here). So here, the number of all possible combination computed using this tool (provided the values of ‘n’ and ‘r’, where, n= total number of compounds present in the training set and r= number of compounds removed during cross validation) corresponds to the number of models that will be eventually developed and evaluated. So one can adjust the value of ‘r’ with respect to the computational power available. Please see input file/s provided with the tool folder for further clarification. This tool is especially helpful during QSAR model development while working on excel sheets. It can be used to extract only those compounds whose compound identifier (number and not alpha-numeric or alphabet) is provided in a text file and the extracted data is saved as a separate excel file. The compound identifier present in the text file (provided by the user) is matched with the numbers provided in the first column of the input parent file, and once matched the entire row is extracted and saved in the output file. Here, the first column (comprising compound identifier) must be present in the input file. Please see input file/s provided with the tool folder for further clarification. File Format: Compound number (first column), Descriptors or any property (Subsequent Columns). This tool is especially helpful during QSAR model development while working on excel sheets. When you need to select few descriptors out of all the descriptors (in columns) present in the excel file (.xlsx., .xls, .csv). Such condition arises when you have selected, let say, 40-50 descriptors (out of 1000 or more) after initial GFA analysis or molecular spectrum analysis and now you want to extract only those selected descriptor from the original file comprising of all the descriptors. This tool helps to extract only required descriptors whose names are provided in a text file (provided by the user) and the extracted data is saved as a separate excel file. The descriptor names provided in the text file are matched with the header names (first row) in the input file, and when matched, the corresponding column is extracted. So keep in mind the names of the descriptor to be selected should be same in both text file (provided by the user) and excel input file. As default, it will also extract first (serial number) and last column (activity column), even if the respective header name is not provided in the text file. So if your input file does not have any serial number (first column) and/or activity/property column (last column), then remove the respective columns from the generated output file. Please see input file/s provided with the tool folder for further clarification. This tool randomly shuffles the entire descriptor matrix, while keeping the values of acitivity/property same. This is useful to prepare X-randomized model.Please see input file/s provided with the tool folder for further clarification. This tool randomly shuffles the activity values, while keeping the descriptor matrix same. This is useful to prepare Y-randomized model. Please see input file/s provided with the tool folder for further clarification. Y-randomization method is one of the recommended validation methods while doing QSAR and one has to develop 10 or 50 or more Y-randomized models. This tool randomly shuffles the activity values, while keeping the descriptor matrix same and can generate more than 1 y-randomized models. So here user can mention number of Y-randomized models required to be generated. Although, user can find the MLR Y-randomization tool on this website, but this tool is useful when user may require Y-randomized models for some other analysis purpose. Please see input file/s provided with the tool folder for further clarification. All the above programs have been developed in Java and are validated on known data sets. * The programmer is highly grateful to Department of Biotechnology, Government of India for providing financial assistance. This program calculates qualitative validation parameters for Linear discriminant analysis and pharmacophore/toxicophore analysis such as sensitivity, specificity, accuracy, precision, F measure, Matthews correlation coefficient (MCC), Geometric means (Gmeans), Cohen's kappa, Guner Henry score and Recall for selected threshold based on the confusion matrix. Please Share and Like this page, if you find these tools helpful.